Happy Holidays from the OVFCC! On behalf of the Ohio Veterans and Fraternal Charitable Coalition, its members, partners and supporters, and from all vets’ and fraternal organization across Ohio and around the world, we wish you a happy holiday from our family to yours. It has been a very big year for the OVFCC, and we’re looking forward to a happy and prosperous new year in 2014. So from all of us to all of you, Happy Holidays! WCMH NBC-TV in Columbus, Ohio recently featured a story on the recent civil case, filed on behalf of the Ohio Veterans and Fraternal Charitable Coalition and Ohio AmVets, to allow electronic video raffles to continue operations. The case will allow OVFCC members to turn their machines back on without fear of penalty from the Ohio Attorney General until the Ohio Legislature has time to consider pending legislation on the matter. The Ohio Legislature, which returns to session in January, is considering HB 325, legislation proposed by Representative Rick Perales, that would clarify current law concerning how veterans and fraternal organizations support local and national charities. To date, the OVFCC Electronic Video Raffle Program has raised over $6 million for charities in under two years. The program also helps keep local veterans and fraternal posts open to their membership in these tough financial times. For more information, stay tuned to the OVFCC blog, your source for information about SB 325. Today the Ohio Veterans and Fraternal Charitable Coalition and other parties filed suit in Franklin County Common Pleas Court seeking declaratory judgment on the legality of charitable video raffle terminals at our member organization posts and lodges. Last week, after the legislature adjourned for the remainder of 2013, we abided by the Attorney General’s request to shut down the terminals since no legislation would be considered until the legislature returns in January. While we understand that the Attorney General’s office was simply doing its job, this was costing our charities over $15,000 per day at a time of year when charitable requests are at their peak. We could not stand by and do nothing when we believe the video raffle system we are operating is already legal under Ohio law. So we took the matter to court where we received a temporary restraining order against the State of Ohio while the court considers the case. This will allow our posts and lodges to continue raising charitable funds through the centralized video raffle system. Every single dollar raised by the raffle program is tracked electronically in real time and accounted for on our transparent reporting system. Since its inception, our charitable video raffle program has raised over $6 million for charities. Our first priority has and will remain to encourage the legislature to pass HB 325 (Rep. Rick Perales), which would clarify state law with regard to the legality of video forms of bingo conducted for charity. Under Ohio law, our organizations are already permitted to play various forms of charitable bingo in order to raise funds to support our post/lodges and local 501c3 charities, with the net revenue being split 50/50. HB 325 would simply clarify that we are allowed to play these same games in a more entertaining video format. The bill would also keep regulatory authority over charitable video bingo with the Attorney General. We are hopeful that soon after the House returns in January, HB 325 will be scheduled for sponsor testimony in the Policy and Legislative Oversight Committee. In the meantime, today’s TRO will allow our organizations to continue to raise funds to support their posts/lodges and their designated charities. > The proposed Lottery program may be unconstitutional. The Ohio Constitution clearly states that all Lottery revenue must go towards funding education. We recently sought a legal opinion from a trusted law firm on this issue. The opinion states that the Lottery program “violates Ohio’s constitution. Specifically, it disregards Article XV, Section 6, which mandates that the entire net proceeds of a state lottery be used solely for education. Because the Proposed Deal runs afoul of the Ohio Constitution, it should not be approved or funded.” Click here to see the legal opinion memo. Based on this opinion, there are no guarantees that our 501c3 charities will receive a single nickel from the Lottery’s program. > The Lottery program would give 60% of the revenue to a foreign vendor, and nothing to our local charities. Under the Lottery’s program, 60% percent of the revenue will go to Intralot, a foreign company based in Athens, Greece. The Lottery will take 15% and give posts/lodges 25%. Nothing will go to our local 501c3 charities. Under the current OVFCC raffle program, the vendor receives 40% of the revenue and the charities and posts/lodges receive 60%, or 30% each. > The Lottery’s next step will be to take over paper forms of bingo. We’ve recently confirmed that the Lottery also has plans to try to take over paper forms of gaming at our posts and lodges, effectively doing away with charitable gaming as we know it. It’s unfortunate that the legislature has not taken action on this issue and we remain hopeful that legislation will be passed in early 2014. This has put us in a position where we had no other option but to go to court. Otherwise our organizations and charities would lose millions of dollars in vital funding. We would greatly appreciate support for HB 325, which would resolve this situation through sound policy rather than a court battle. On December 7th and 8th, VFW and American Legion Posts in the Mansfield, Ohio area are following a recent trend in giving back during the holiday season. Crestline, Ohio VFW Post 2920 and Galion American Legion Post #243, proud members of the Ohio Veterans and Fraternal Charitable Coalition, are joining forces with WMFD-TV in Mansfield, along with FedEx, the Christmas SPIRIT Foundation and Sugargrove Tree Farm to try and fill a FedEx truck with Christmas trees to deliver to our troops at various Army, Navy, Marine and Air Force Bases. The trees can be purchased and donated for just $25 at the Sugargrove Tree Farm, located in Ashland, Ohio. Trees for Troops is a national program that aims to “deliver the spirit of Christmas to military families – one Christmas Tree at a time”. Since 2005, the charity has provided more than 122,000 trees to military families both home, and abroad. 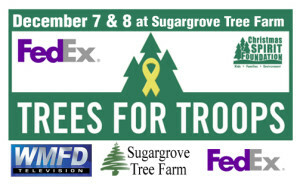 This year’s goal is to send over 140,000 trees to military families and bases. It’s an ambitious undertaking that will be tackled by over 30 tree farms in 13 states, including four farms in Ohio alone. Ashland VFW Post 1067, Shelby American Legion Post #326 and Bellville American Legion Post #535 are also proud supporters of this weekend’s event. 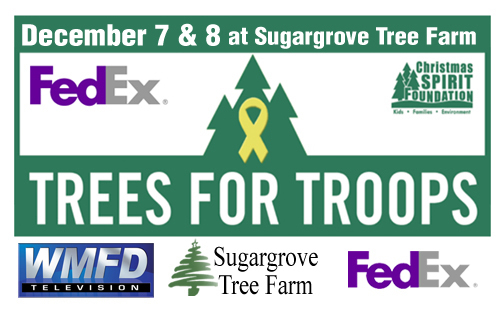 The OVFCC supports Trees for Troops, the Sugargrove Tree Farm and Mansfield area OVFCC members as they serve military members all over the world this weekend!